People not only in your neighborhood but also in your town and more should tackle the same problem. Come hand-in-glove with each other! That was the main statement of Mr. Kanji Wada, I think. There was a big meeting for a campaign against gangs at Sun Plaza Seasons yesterday. After terribly boring, sleepy and empty orations by the ward mayor, the police chief, and other “great” people, Mr. Kanji Wada appeared on the speaking platform, when the mood changed. He beamed and took a look-around in the room, where there were more than 500 participants. 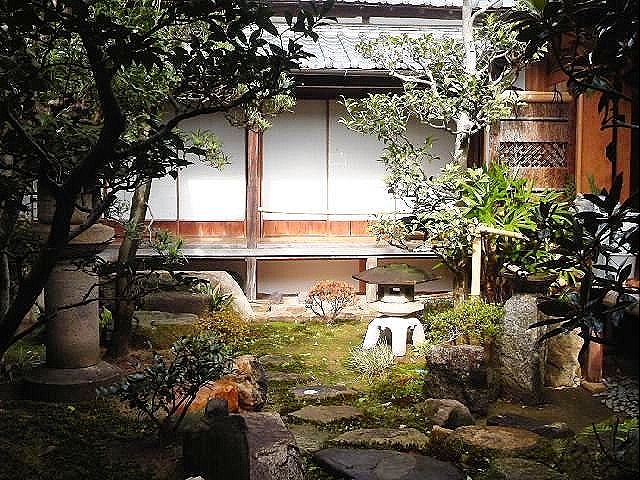 He looked like an ordinary Japanese old man with receding gray hair and glasses. But he is not. He is the vise-president of an association against gangs in Kobe and has succeeded in repelling a gang group from his area with his neighbors. He came to the meeting to make a speech yesterday. His story was really nice and impressing. I’m sure no one was sleeping while he was talking. Mano and Higashi Shiri-ike, where he lives, is in Nagata in Kobe which is a quake-hit area of the Great Hanshin Earthquake in 1995. In January in 2006, another thing hit the recovered place. 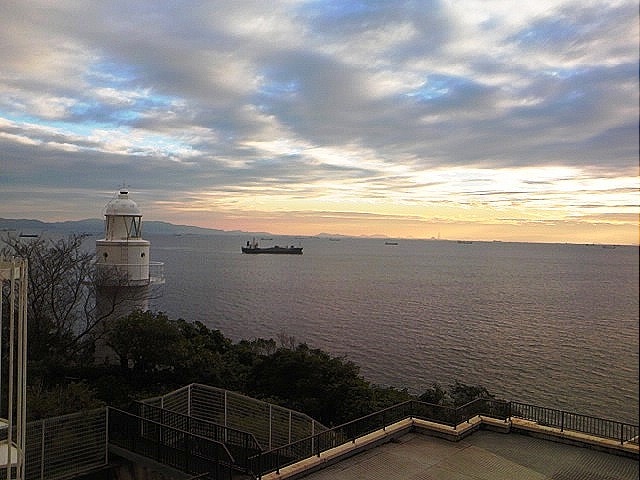 A gang group called Konishi-Ikka moved to their place. The atmosphere in the street changed after their arriving. Imagine many gangsters walking in the street. But his area never gave up retrieving their place which used to be safe and pleasant to live. He and his neighbors have established a group for fighting against the gang group and won! The gang came to the place in January that year and went out of the place in November in the same year. Residents in town have succeeded in kicking the gang out! Mr. Wada said, “Of course, we were scared, first. Everyone wore a cap and a mask to hide their faces when they walked in front of the building. Anyone is terrified when they are alone. But we unified and fought together, which got rid of our fear. His speech was impressing and made all the participants cheered. It’s difficult to fight alone. But we can tackle the same problem all one. I’d like to close by introducing a story written on the document for the meeting. The story was made for people in Mano and Higashi Shiri-Ike to remember their fights against the gang. A story by a catfish in Mano-ike Pond: There has been clapping sounds by wooden sticks around the pond at every night for these 10 months. People in this area has worked hard and saved their homes and town. Residents’ power is really great once and now here. Those have gone. That’s great. I’m very happy. Have you ever heard this? There used to be an ancient tomb named Nembutsu-yama-kohun from 7 cho-me Karimo-dori to 6 cho-me Hamazoe-dori. It was so big as Goshiki-duka-kohun, the ancient tomb, in Tarumi that ancient people must have had a tough time to build it. So, you see that many people have lived here in Mano since 1600 years ago. I hope this place is safe and pleasant to live forever. I don’t worry about that because people love this place. They never complain about patrolling at night, cleaning the street, or helping with festivals. Many people got together and united with those wooden sticks…. I sprained my ankle last Sunday…Ugh! Then, I went to see a doctor at Higashi Nagoya National Hospital next day. I found a leaflet which said the hospital’s ideal, basic policy, doctors’ schedule for out-patients at the waiting room, and some essays written by its staffers, and was reading it while waiting for being called my name. I’ve found an interesting article written by Dr. Kenji Ogawa, the chief of clinical research department (respiratory apparatus) in the brochure, and I’d like to introduce it here. But this is my English translation because the original is written in Japanese. There is something equal for everyone in human society filled with inequality and unjustness. What is it? Death is certain to come to us all whether you are wealthy and have authority, or not. That is, death is fate we cannot fly from. Nevertheless, we don’t talk about our death much. Stories about death tend to bear religious overtone, but some people have studied them academically and scientifically. On Death and Dying, written by Elisabeth Kübler-Ross, M.D., who was a female pediatrician in Switzerland and well-known for her seven academic degrees, is described as a bible for medical service workers, especially, for staffers who engages in terminal care. We may see the real meaning of life when we accept that death is inevitable and real. There is an area of leaning called near-death experience study, in which researchers analyze things during the period of unconsciousness experienced by people who have lost consciousness with cardiac and respiratory arrests, and have been dead medicinally, and then have come to their senses by resuscitation techniques. In Japan, Mr. Takashi Tachibana, a journalist, has written Near-Death Experience, and NHK has televised a feature program of the book. In addition, Dr. Koichi Mori, an internal medicine specialist, has told his own near-death experience in his book. You may have seen some scenes of near-death experience on TV or screens. There’re some common points in near-death experiences. We might be able to make our life richer if we tried to see death seriously. I’m going to be conscious of my own life and death, and I’d like to engage with positive thinking as a health worker. What do you think after reading the article? I get interested in near-death experience and thinking of my own death. Death comes to us all. We can’t fight it forever. Let’s live life to the full! How generous Aichi University is! 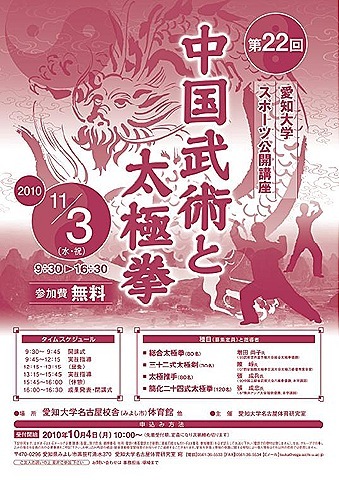 They held an event called “Chinese Martial Art and Tai Chi Chuan” on Nagoya Miyoshi campus for free on November 3rd. It was the 22nd annual event this year. 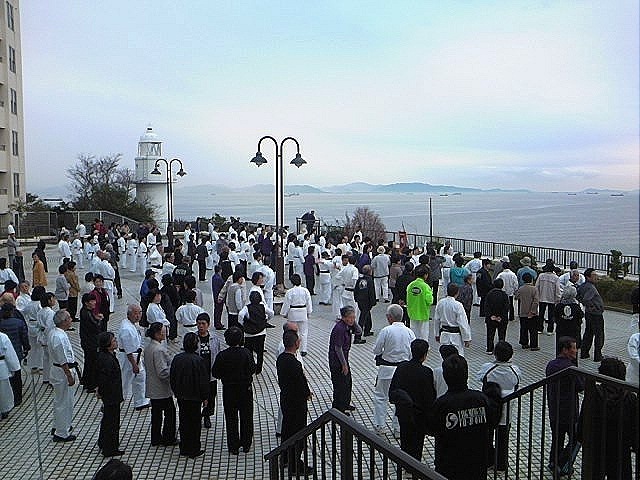 There were four events: The 42-Form (Competition Form) Tai Chi Chuan, the 32-form Tai Chi Sword, Tai Chi Push Hands, and the 24-Form Tai Chi Chuan. I took the 24-form Tai Chi with two of my friends. Actually Tai Chi I usually do is different from that one. 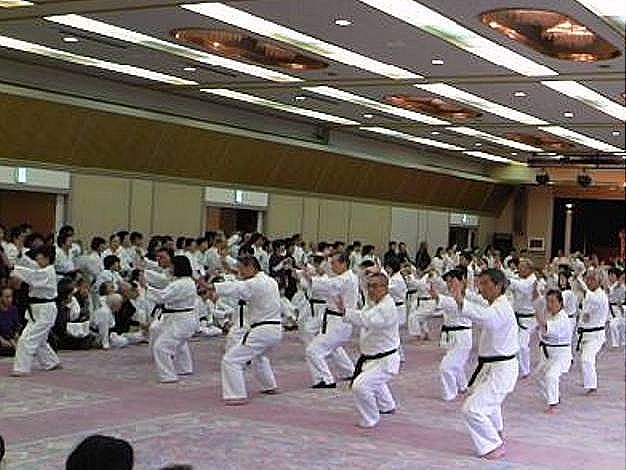 What I do is Yang Ming-Shi style, which was made from the 24-form Tai Chi by Mr. Yang Ming-Shi 50 years ago and has spread here in Japan. Actually it was not only me who took part in the event, but also many people who belong to Yang Ming-Shi style was there. The reason why I took the class at Aichi University because I thought I was able to learn many things through the original style and seeing other events. 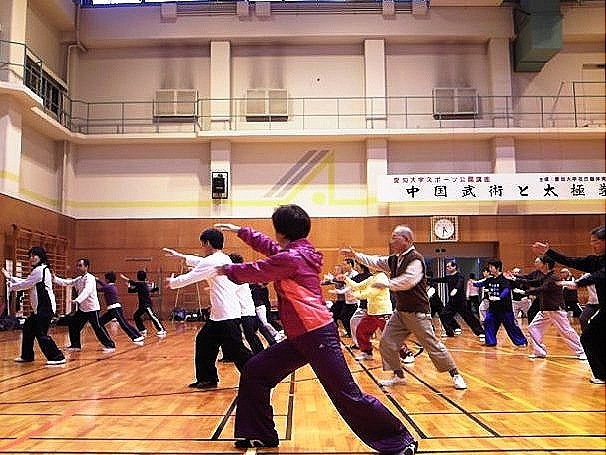 Amazingly, there were 150 participants in the class of the 24-form Tai Chi that day. 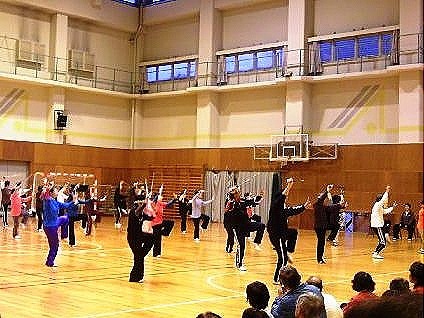 I was very happy to know such many people love and enjoy doing Tai Chi. Not only the teacher but also many people around me taught me. I enjoyed not only doing Tai Chi but also chattering with many people there. That was wonderful. But I was really tired because I was at the gymnasium from before 9:30 in the morning to after 5:00 in the afternoon. There were performances of kung-fu by students of the university, of the 32-form Tai Chi Sword, of Tai Chi Push Hands, and the 42-form Tai Chi. Students’ movements were strenuous and energetic. 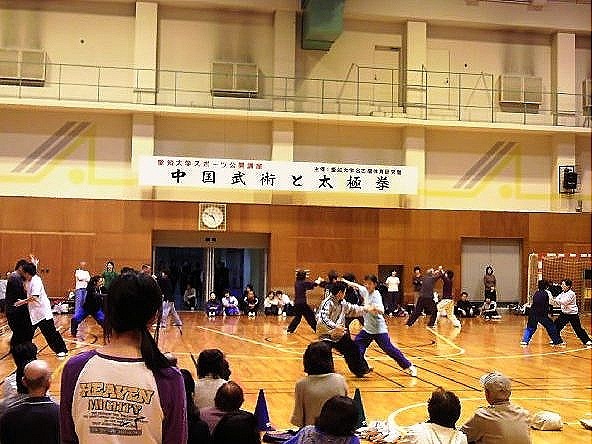 It was my first time to see Tai Chi with swords. It looked really difficult, but interested me. Tai Chi Push Hands is Tai Chi played in pairs. They looked like dancing, but I know you can’t do that unless you’re an expert. I’d like to try it someday. The teacher of the 42-form Tai Chi is very beautiful. I’m a fan of her. Her movement is powerful, energetic but elegant and smooth. I’ve heard that Aichi University is going to move to the developing area of Nagoya Station soon. What will happen to the old campus including the gym? I hope they keep having the wonderful event. It was a fair weather! I would have liked to say that…Actually the typhoon was approaching to this area that day and I was afraid the training camp would be cancelled. 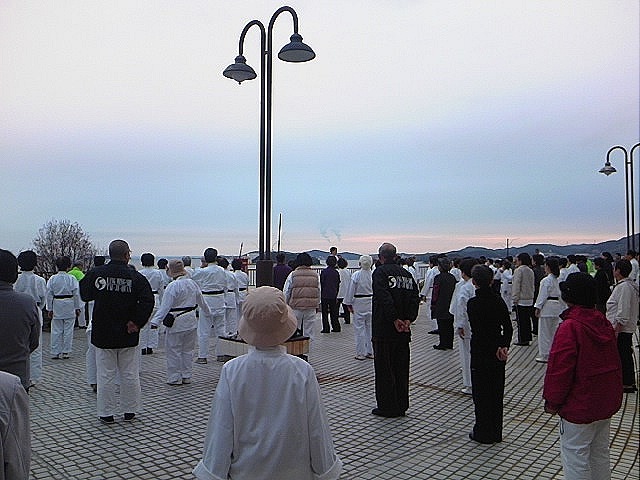 There was an annual Tai Chi camp in Gamagori on October 30 and 31. I took part in it with two of my friends just as last year. 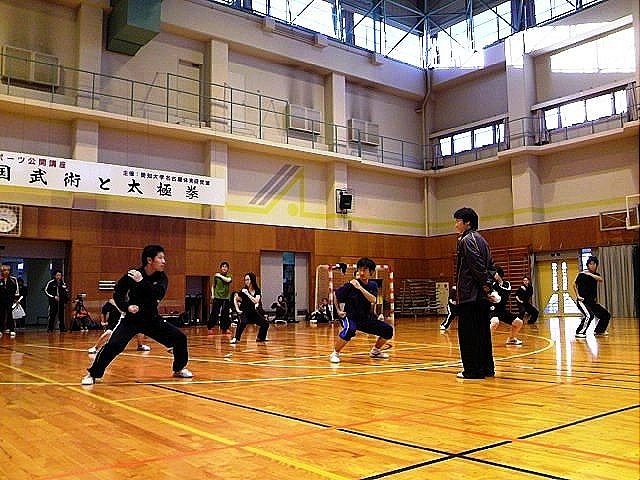 The training camp was held by Aichi branch of Japan Health Taijiquan Association. 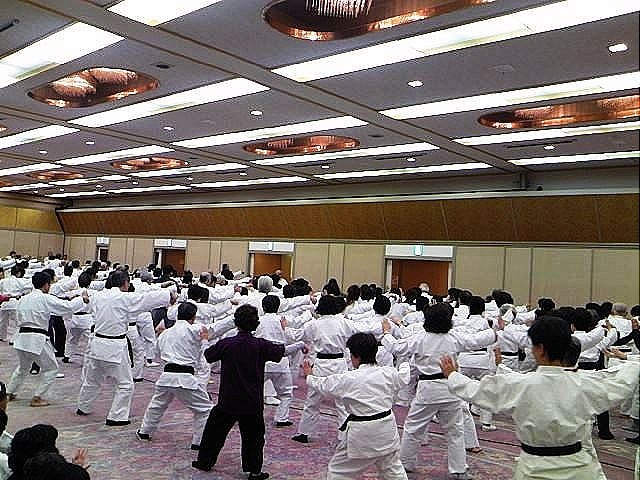 The number of the members of Aichi branch has increased and is more than 5000 people now. So, there were near 400 participants in this camp this year! The participants got together in the biggest room of the hotel after check-in because it was raining and windy outside. We usually do exercises and Tai Chi together outside, but we couldn’t this time. First, Ms. Yang Kay, the daughter of Mr. Yang Ming-Shi, lectured us, and then we were separated into two groups and checked the points each. I found out that my new room mates were really nice. Amazingly, I’ve never met any nasty people who do Tai Chi, though. After introducing ourselves and enjoying chatting, we had a big feast. This time we had a small concert of mandolins and a guitar. 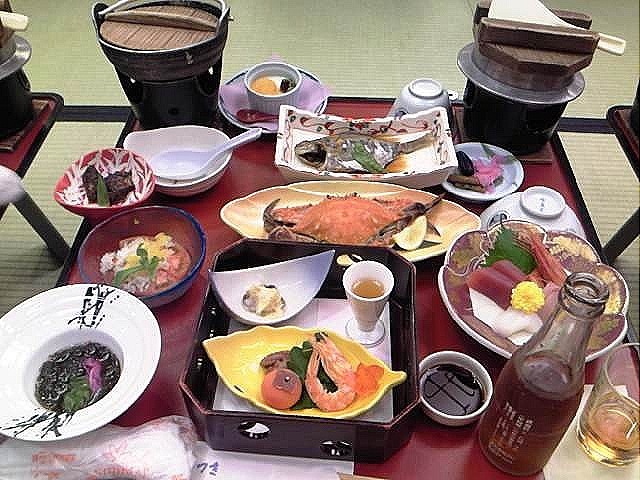 The food was nice and gorgeous, but I think it was too much I c ouldn’t eat all and couldn’t believe to see tempura coming at the end of the feast. 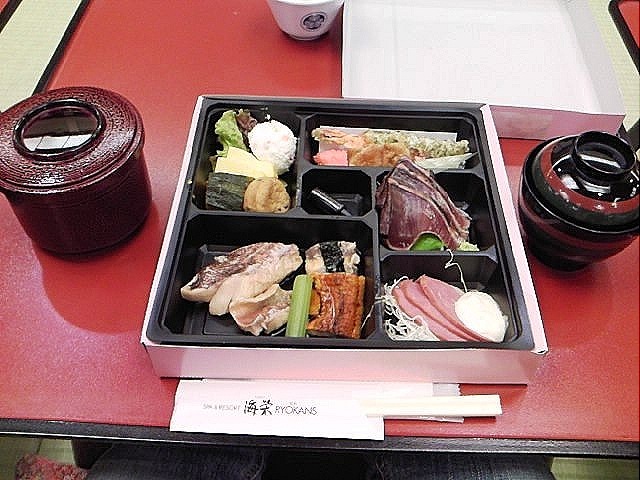 In addition, there was too much animal protein. We need vegetables, too! Don’t you think so? After the feast, some went to the open-air spa, some went to the small concert again, some visited friends’ rooms, and some went back to their room. I relaxed in my room and played on-line games of mixi with my cell phone. Yeah, I know, I’m a game-junky. I also enjoyed chatting with my roommates. 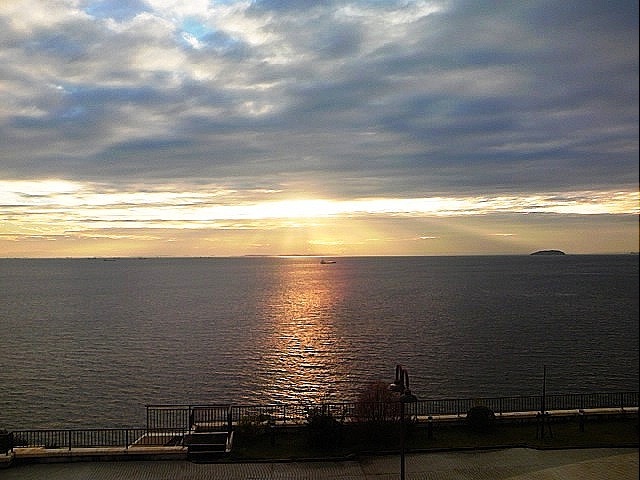 Next morning, I got up at five thirty to take part in the morning practice which started at six thirty. You know, girls need a lot of time to make up! It stopped raining miraculously during the time and we were able to do Tai Chi outside. It was cold but we had a nice time. 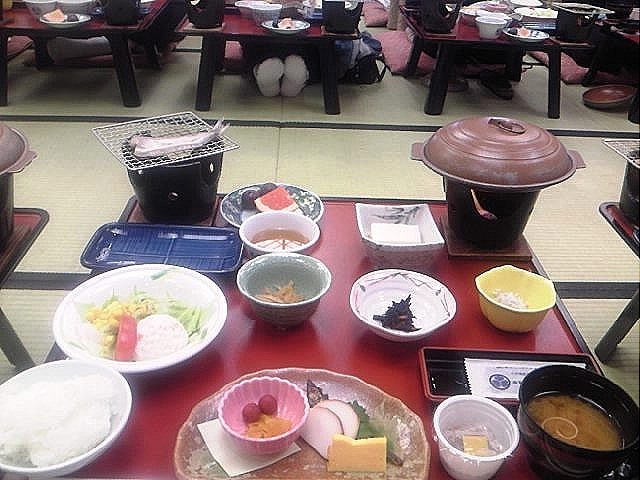 There was a test for becoming grand-master after the breakfast. 66 people took the exam and all of them passed it! Congratulations! They’ve become grand masters! Then…too much protein again…I might go to the camp just to eat a lot this time…Anyway, I met some old friends and made some new friends there, and had a great time together with them. 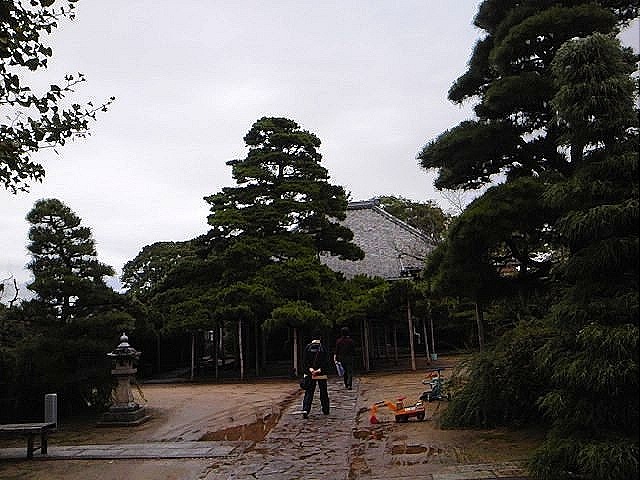 After the camp was over, the two of my friends and I went to Kochu-ji Temple, where Mr. and Mrs. Sakuma live. I’ve visited there every year since Mrs. Sakuma and I met at the Tai Chi camp three years ago. Although Mr. Sakuma took part in the camp, she couldn’t because of looking after their grandchildren home this year. I was happy to see her again.